ja, burger is a machine!! I hate the way commentators influence peoples views on incidents. It was a strange tackling technique, or rather BAD tackling technique, but calling it not legal is a bit much IMO. He's a complete monster that Burger. When I first saw him play I didn't think he's be able to sustain that work rate, for such a huge guy, but he must have an incredible natural sort of fitness to be able to keep it up. Poor Williams on this one though. Looked horrible and sad to see him go off after getting through the ankle niggles from the previous week. Strange collision though I have to say. Reminds me of Williams and Chabal.. last year was it? it was a bad tackle thats all.. you see his arms trying to wrap round but both players bounced back before burger could wrap his arms.. there was an attempt.. pls dun get influenced by the commentators.. there were blind too.. I feel sorry for Williams lol. Chabal charged through him head to head and knocked him into next week. A year on and he tries to charge through Burger in a similar fashion and again gets knocked into next week. Gents, the commentator actually gave ol "Bash-em-crash-em" Burger props, but this cat has craaaazy stamina! Would love to see him reaaally tackle Palu outa his socks. But i totally agree with Mallet...SA and the island teams are all VERY VERY physical, and the awsome thing is they all respect each others ruff stuff...lol...once the match is over theres normally smiles on their faces. of course he is! he's a flanker and flankers are the toughest players on the field. 2nd row is the least demanding possition in the pack (physicaly). I wouldn't say that T, the second rows are the engines of the scrum. Without them pushing the props, scrums wouldn't nearly be as physical. Either way, Burger is a machine. I easily rate Schlak best openside, miles ahead of the weed that is McCaw. Burger feels no pain and takes down anything. He is incredible. i wanna see the video of henry tuilagi running thru all three of SA backrow at once... probably the only highlight for samoa in the whole world cup tourney! Anonymous above - use the request section for that please. And use a name when posting comments. thanks. I admire Shalke, but that tackle wasnt legal. Williams needs a bigger scrum cap. or should get one of those nfl helmets. that hat of his probly saved his life right there. skulk crushes tanks on his head for fun. both been pwned by each other! cotton, don't be so one eyed. Schalk tried to put his arms round Ali, you can see that after the impact, Ali obviously surprised him and he mistimed his tackle. Still Ali came off second best. Burger has got one hard head fer sher . Burger was just sick and tired of Williams sticking out his tongue during the haka, just like the rest of us. When youve got a nickname like Robobok, who needs tackling technique? 212 you must not know much about rugby!!! Schalk Burger plays blindside flanker not openside!!! I didn´t saw it like a big hit, just a head to head bang (thing that happens every now and then). It´s my first time posting here and i just wanted to thank you for all the vids. I´m from Uruguay and the local channels don´t show all the games so it´s nice to at least watch a vid with all the tries. So thanks! "212 you must not know much about rugby!!! Schalk Burger plays blindside flanker not openside!!!" Schalk Burger plays openside. No surprise you're not using a proper name. Was that even meant to be a tackle? Looked to me that Williams stumbled into Burger without the latter really expecting it. As for calls that whis was an illegal tackle. Rubbish! It was not even a tackle but a head clash, Ali was onto Burger sooner than he thought which is why his arms were still a fair way from wrapping around. 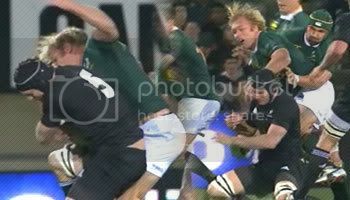 That certainly wasn't a legal tackle - Schalk seems to have problems with where to put his arms when making tackles - they often seem to end up wrapping around someones head - you saw his arm flying over Williams' head there, and that simply shouldn't happen. You saw the same thing in previous games - e.g. when he attempted to tackle flood previously. Not as bad as Henson for not using the arms though - that guy cant help but put the shoulder in. It was legal. just hit heads and that can't be counted as illegal. I agree with Mallet though, the mental aproach is different. The Afirkaans players are hugely physical as a culture as are the south sea islanders and the Aussies are really arogant, but in a good way for sport. Speaking of OZ (martin-offload) i see they got their human smash machine (Palu) for the weekends test, now this is what i wanted to see....Burger lining up Wycliff. But then again AJ tried the same thing and came off decidedly second best! I'd still my $ on Burger tho, coz even if he's run over (once in a blue moon) he bounces right back up to tackle again. Funny thing though on a poll taken on a NZ site they would rather have Matfield than ol Burgs?? "Funny thing though on a poll taken on a NZ site they would rather have Matfield than ol Burgs??" Makes sense, it is the kiwi's weakest area in the game, their line outs. Shows what good scrum caps are huh?Big hit though i would hate to have to run into a boy burgars size be like running into a brick wall and expecting the wall to give.